In this photo, the equipment normally carried in a patrol unit in 1942 is neatly displayed and ready for inspection. The 1942 Fords were the last cars purchased by the Highway Patrol until after World War II. MINNESOTA HIGHWAY PATROL within its borders. The vehicle's unit number was placed just below the driver's window. Notice the frost shields on all the windows. 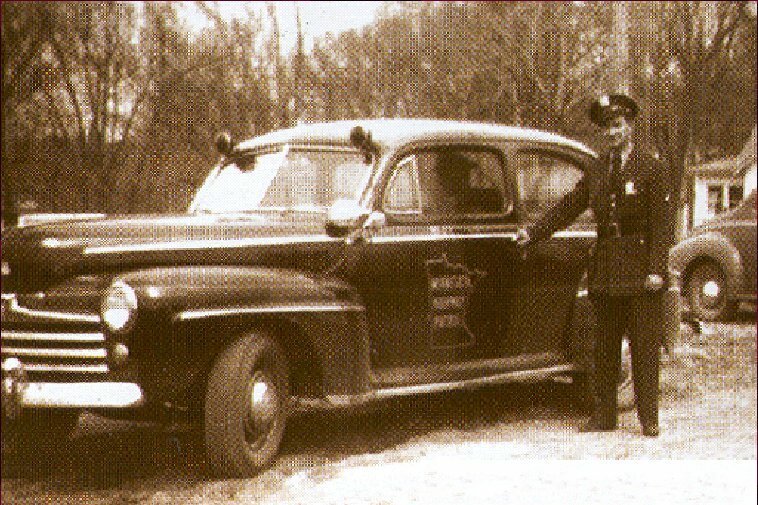 1948 Ford Tudor pictured with Officer James Curto. The 1948 Ford was a carryover of the 1946-1947 models with a few minor styling changes to the grille and turn signal lamps. The first body design change since before the war, the 1949 Ford was pretty sleek looking compared to its predecessors. Ford continued to use the Flathead V8 displacing 239 cubic inches. However, the cars of the Highway Patrol may have been powered by the slightly larger 255 cubic inch Mercury engine. The door shield was modified again this year with the addition of the vehicle’s unit number below the Highway Patrol legend; a configuration that would remain in use through 1959. The first true “Police Package” car was introduced by Ford in 1950. In prior years, police agencies special ordered many heavy duty components when purchasing their cars. 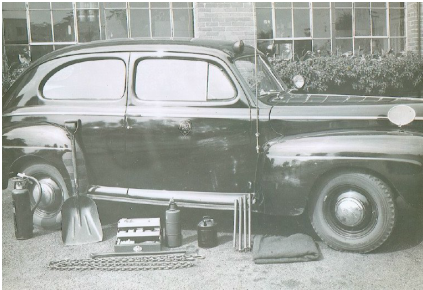 In 1950, checking a single box on the order form got you all of the severe service pieces police agencies requested most; a bigger engine, bigger brakes, better cooling, heavy duty clutch, heavy duty suspension parts, and even heavy duty upholstery.